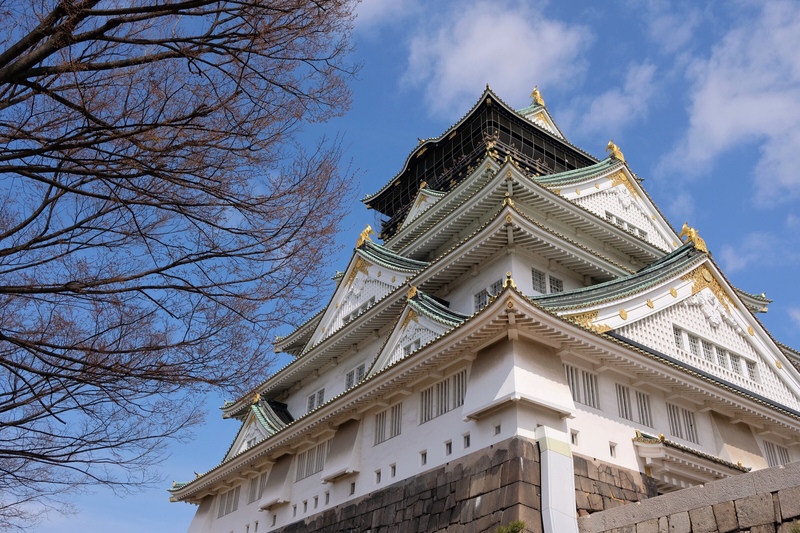 On our first full day in Osaka, we visited Osaka Castle, which rests on about one square km of parkland, has a five storey main tower, impressive stone ramparts, and a wide moat that you cross via a main bridge. Inside, we took the stairs up to the very top to look out from an outdoor platform at views of the city. It was a warm, sunny day and the sight was spectacular. Next, we walked down through each floor, which houses museum artifacts outlining the history of the temple and its builder, Toyotomi Hideyoshi and his successors, starting from the year 1583. The museum was mostly filled with scroll paintings, armour and letters from the time of construction, and gave us a great sense of the scope of the site and the incredible impact it had on Japan’s unification during the 16th century. 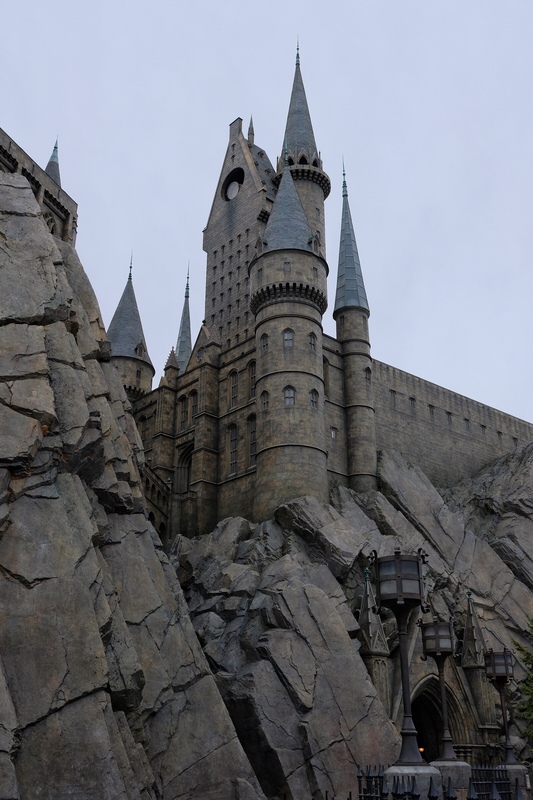 Hogwarts at Universal Studios Japan. The next day was completely different. We got up early to hop on two subways to get to Universal Studios Japan, arriving at 8am. The crowds at the entrance were already huge, but thanks to the fact we bought tickets online the day before, we got in quickly and joined the crowds sprinting for The Wizarding World of Harry Potter, which is set up like Hogsmeade, the fictional town where Hogwarts is located in the books. We lined up for Harry Potter and the Forbidden Journey, 4D ride that had us flying on broomsticks over Hogwarts, past animatronic fire-breathing dragons and floating, chilling dementors. It was incredible, and only made me feel a bit queasy. 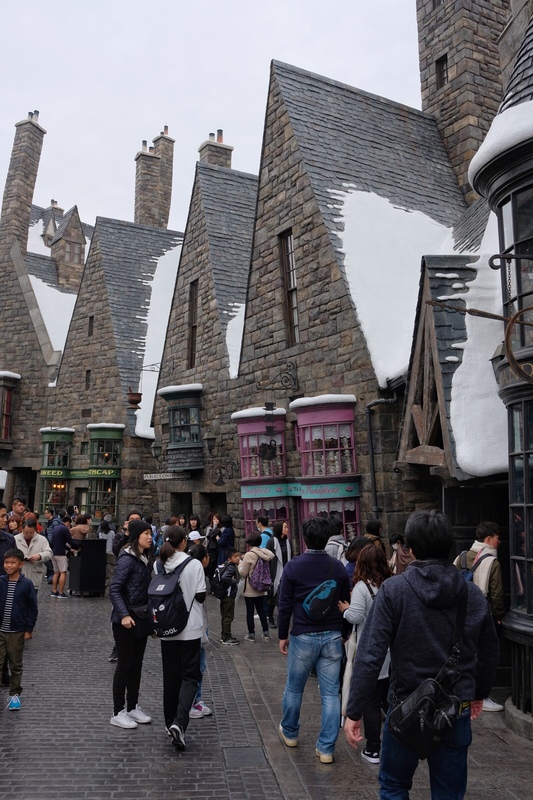 Walking through Hogsmeade at Universal Studios Japan. 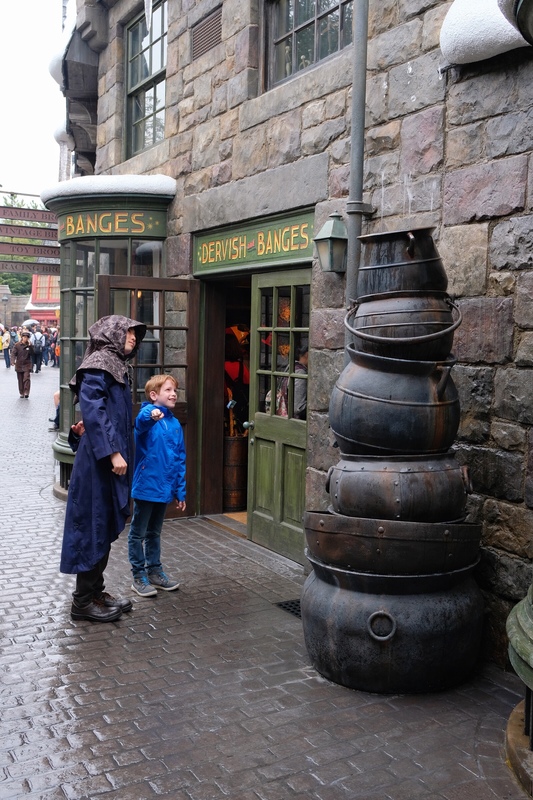 We spent a lot of time in “Hogsmeade”, drinking butterbeer and shopping for Bertie Bott’s Every Flavour Beans at Honeydukes. We even found the little man his very own wand in Olivander’s, called “Rowan”, which has a sensor in it, allowing him to do “magic” in the recreation of the fictional town, like opening a locked door, shooting fire up a chimney, and making it snow. He loved it and had an absolute blast. Rowan learning magic in Hogsmeade. Later we went on The Amazing Adventures of Spider-Man 4K3D ride, Terminator 2:3-D, and at the end of the day, we lined up for two hours (ack!) for Despicable Me Minions Mayhem, a crazy and fantastic 3-D ride that we all loved. 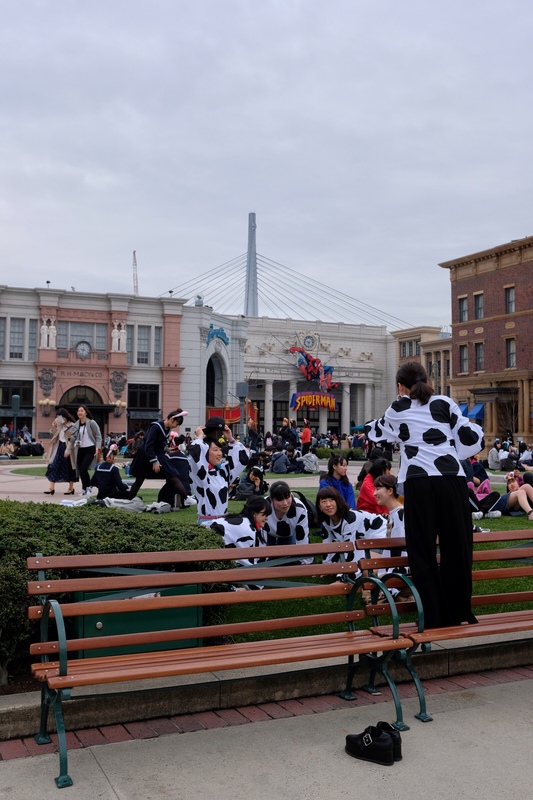 Groups of people hanging out front of the Spider-Man ride. We didn’t get back to our hotel until 8pm, completely exhausted from the walking, the rides and the lines. But we were super glad we got to experience the theme park, especially the Harry Potter world, which itself is worth the price of admission. Whale sharks at Osaka Aquarium Kaiyukan. 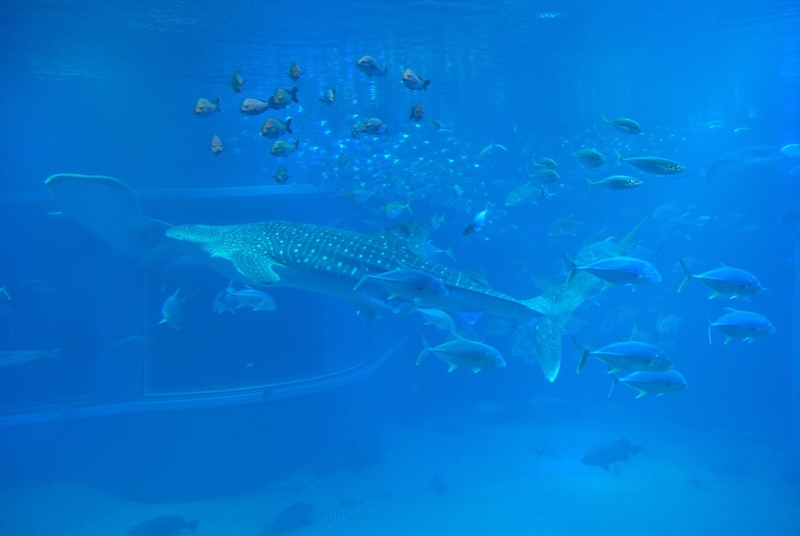 On our last day in Osaka we went back to the same area and spent the morning at Osaka Aquarium Kaiyukan, which is pretty big, with 8 floors of tanks including a huge one with not one, but two whale sharks! It also has a tank with the weirdest looking fish – Ocean Sunfish, one with Giant Crabs, another with penguins including Emperor Penguins, and another with seals including a baby spotted seal. 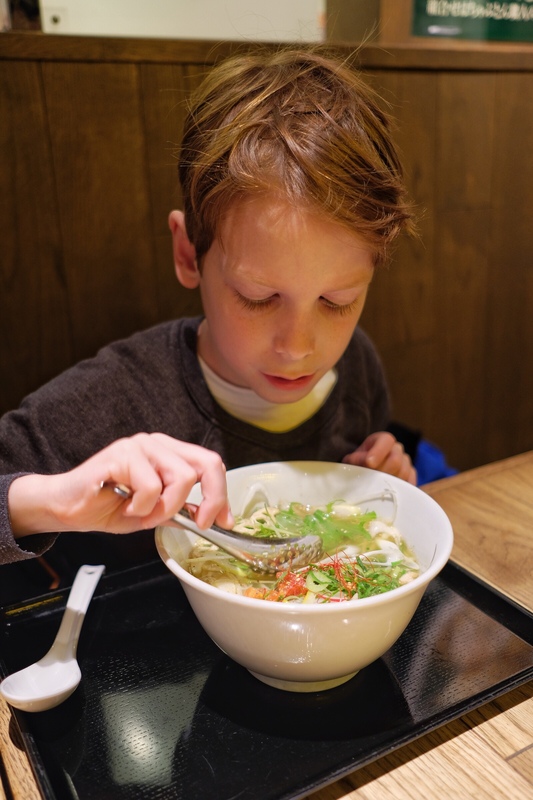 Rowan enjoying vegetarian ramen at Chabuton. We had a great time there and enjoyed a relaxing afternoon doing not much of anything before having fantastic vegan ramen at Chabuton, a restaurant on the eighth floor of an electronics and department store at Osaka Station. We had to order and pay for our soups at what looks like a vending machine, which is a typical way to order ramen in Japan. This was our first time though, and it was really fun. We felt like complete locals.